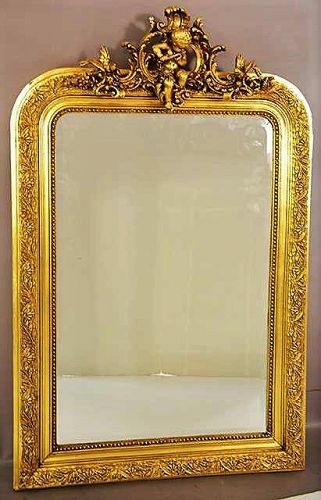 DESCRIPTION: An elegant French Louis XV style giltwood beveled mirror with center crest of birds and a cherub playing a flute, and framed with a gilt beaded and foliate border; Ca. 1890. DIMENSIONS: 46” high x 30” wide. 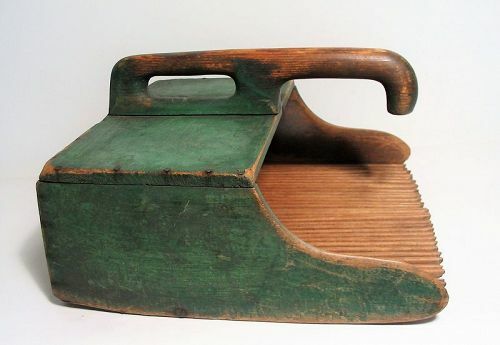 DESCRIPTION: An appealing antique cranberry scoop in original green paint, constructed in a lovely sculptural form with attached handle and a scoop with multiple slim prongs to strain out water without losing the cranberries. CONDITION: Usage wear in all the right places; split to board holding prongs. DIMENSIONS: 13.25” wide x 13.25” long x 7.5” high. 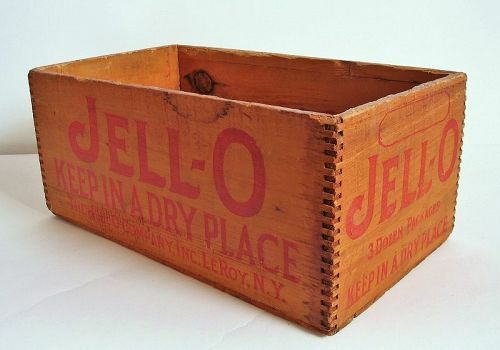 DESCRIPTION: Vintage wood advertising crate with “Jell-O” and other messages stenciled on four sides; dovetailed corners. Good condition, expected usage ware, sturdy. DIMENSIONS: 14” long x 6” high x 8”deep. 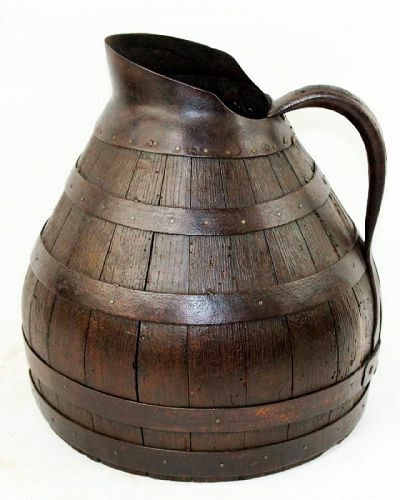 DESCRIPTION: An antique French wine pitcher crafted like a barrel from staves of wood bound by five hand wrought iron hoops. The top hoop forms the neck and spout, the handle is iron wrapped wood. Originating from the Alsace region in eastern France, this pitcher is a wonderful compliment to any French, country or farmhouse décor. DIMENSIONS; 15" high x 12 1/4" diameter. 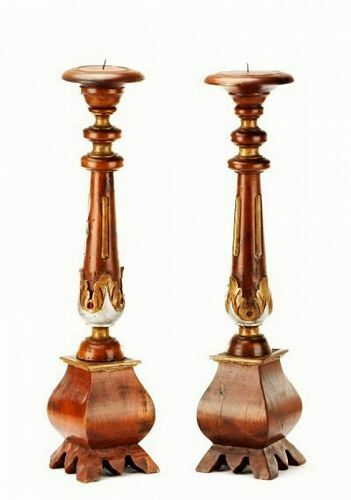 DESCRIPTION: A handsome pair of walnut wood Neoclassical style carved and stained candle prickets with circular tops above turned, tapered and fluted shafts with leaf tip ornaments, above swelled bases with splayed feet. Italian, 20th century; silver and gilt highlights on each. Unmarked, good condition. 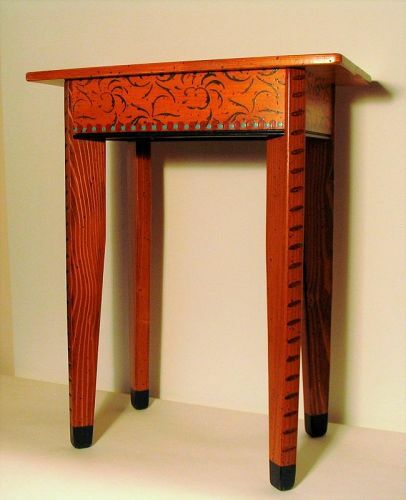 DIMENSIONS: Overall height 25.25".